Ivanhoe is playing live with Audionaut. Hey guys, unfortunately we had to postpone the concert. It is now re-scheduled to October 18th. Ivanhoe will be supoorted by Audionaut. 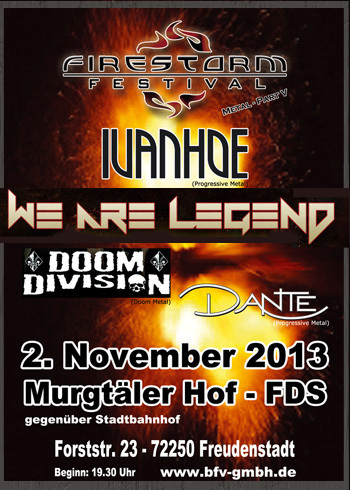 Ivanhoe is playing live with german hardrock veterans Victory. Ivanhoe is playing live with Mayfair. Ivanhoe is playing live with Dante. Queensryche 30th Anniversary Celebration show with Queensrych Freedom Call, Alpha Tiger, Vanish and IVANHOE. 2013 Ivanhoe will release their new studio album called "Systematrix". The new prog metal highlight was recorded at The Red Room Studios with producer Andy Horn (Lanfear, Edenbridge, Voices Of Destiny a.o.) and marks the stunning return of South Germany’s prog rock veterans with their strongest effort so far.